Bamboo in a Barrel, How Can I Move It? I recently bought a house and the former owner left me this very nice bamboo (it's marked phyllostachys aurea) in a large barrel. I am almost certain that the bamboo has grown roots through the barrel and down into the soil. I am unable to budge the barrel even a micron. I want to move it, but would like to save both the barrel and the bamboo, preferable as a couple. If I can only save one, I vote for the bamboo. Bamboo roots / rhizomes are quite shallow, only around a spade depth generally. The roots are more likely to have gone around sideways inside the barrel than downwards like tree roots would. I think it is probably unlikely to have gone through the bottom of the barrel into the soil as the barrel looks like it is standing on some kind of tiles? I am guessing that you wouldn't be able to move it because of the weight of the barrel, the soil, the bamboo, and potentially any stones/gravel or such like that the previous owner may have put into there for drainage or ballast (although I don't think you would need ballast in a wooden barrel!). If it was mine, and I wanted/needed to move it, I would be inclined to take the bamboo out of the barrel first. I would then probably split it into 2 plants and put one of them back in the barrel (wherever you want the barrel to be) with some fresh compost so it will grow better next year. Depending on how big the half left over is, it could either be kept as a second plant to put in a different container or planted out, or if there are enough good rhizomes there you may be able to split it into 2 and end up with three plants. Although be sure to leave plenty of rhizome for each plant to make sure they survive and try not to damage any new shoots. To get the bamboo out of the barrel I would; get a long thin knife or other similar tool and carefully go round inside the very edge of the barrel to loosen the plant from the sides, also tap/knock around the barrel firmly to help loosen it. Then, if possible, get the barrel tipped on its side and try to pull it out; couple of good strong men might be useful. If that is not possible I would try to cut the plant in half with a saw while it is in the barrel then pull each half out. Either way, if you are going to take it out of the barrel, be sure to have everything ready to transplant the plant(s), compost, tools, containers, etc. and a bucket of water to make sure the roots don't dry out while you are doing it. 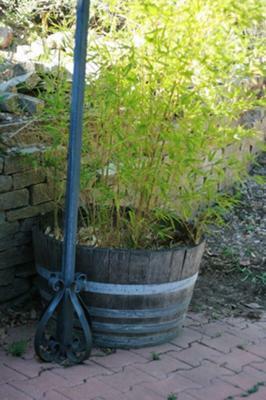 Bamboo Division - read along with instructions for dividing container plants. Thank you so much for such a thorough and prompt answer. Now I know just what to do. Wondering if you have heard of the bamboo park called the Bambouseraie located just north of Montpellier in the Languedoc region of France. We visited it a few weeks ago and it was utterly fascinating and gorgeous. We learned quite a bit about bamboo and many other amazing plants. Thanks again for your help. Hi Kim, I was just wondering if you were successful at getting that bamboo out of the barrel? Hi Caroline, Sad to say but I've done nothing about the bamboo. I moved on to other issues in my garden which is nearly an acre and way too much for me to handle. The bamboo still sits in his barrel and I am surprised at how well it weathered our unusually cold winter (a week of below freezing weather day and night with ferocious winds). Thanks for checking in. If I ever do move him, I will let you know how it goes! Contact me to tell us about your bamboo.